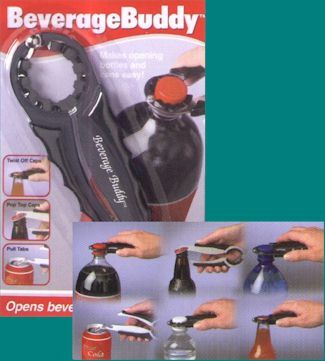 Beverage Buddy; Kitchen products, kitchen utensils, to make life safer. This unique "plier-like' device is great for opening all types of beverage bottles. For screw caps simply place grippers around the bottle cap and twist off. Also Great for getting a tight seal when closing. Has features for opening pop tops on bottles and pull tabs on cans. Made of sturdy black metal with rubber grips along the sides. A great kitchen tool for young kids and the elderly who have difficulty gripping.